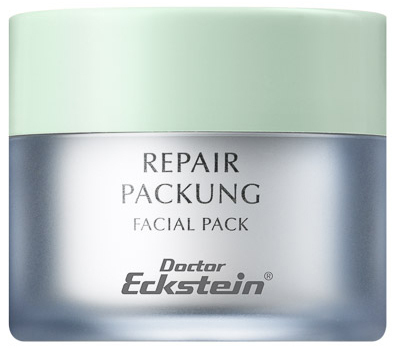 Ultra rich, essential creamy facial pack for mature, demanding, and sun-stressed skin conditions. Improves the skin’s moisture retention abilities, suppleness, and counteracts the signs of skin fatigue. Can help to smooth the appearance of fine lines and wrinkles. Powerful antioxidants help to protect from the environmental causes of premature skin aging. Contains soy extract, natural protection factors, oligopeptides, and phytosterols. Aqua(Water), Olus(VegetableOil), Steareth-7, Caprylic/CapricTriglyceride, Glycerin, StearylAlcohol, GlycerylPolymethacrylate, Urea, DecylOleate, LactococcusFermentLysate, Hydroxyethylcellulose, CetearylEthylhexanoate, Phenoxyethanol, BenzylAlcohol, PropyleneGlycol, SodiumCarbomer, Parfum(Fragrance), TocopherylAcetate, Ethylhexylglycerin, DehydroaceticAcid, DiazolidinylUrea, GlycineSoja(Soybean)SeedExtract, HexylCinnamal, Linalool, RetinylPalmitate, AscorbylPalmitate, Tocopherol, Geraniol, Citronellol, PotassiumSorbate, SodiumBenzoate, PalmitoylTripeptide-1.